WOW… what more can you say about this recipe we found in the Fine Cooking Grilling 2016 issue? We think we make pretty, darn tasty burgers, but this recipe blew them all away and is well worth the effort (actually, pretty minimal effort) of making the Bacon-Onion-Balsamic Jam. 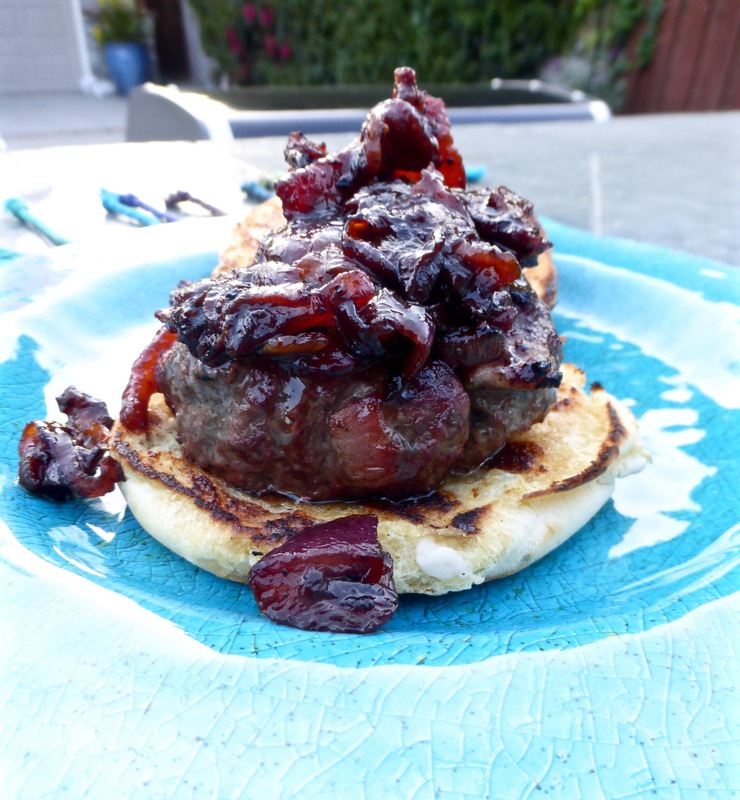 Of course, if bacon is not your thing (subscriber Burt, you may now leave the room) then this recipe isn’t for you. Be sure to use a high quality, thick cut bacon. We used Trader Joe’s Uncured Apple Smoked Bacon. 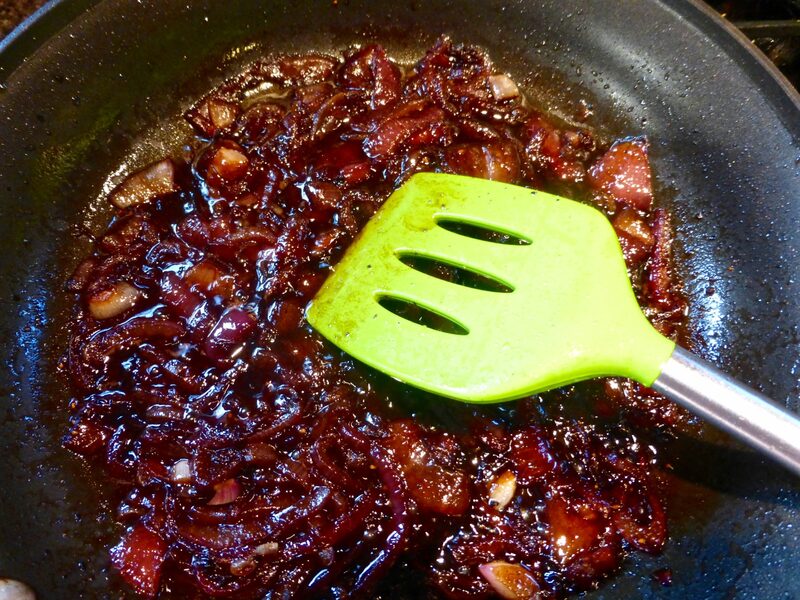 In a heavy-duty 12” skillet, cook the bacon over medium heat until lightly browned but not crispy, about 8 minutes. Transfer the bacon to paper towels to drain. Add the onion to the skillet, season with salt and pepper, cover the pan and cook for 2 minutes. Uncover, add a splash of water, and stir. Cover and continue to cook, occasionally stirring, until the onions are soft and beginning to color, about 10 minutes. Add the vinegar, mustard and 1/3 c. water. I also added a teaspoon of sugar at this point as we like it a tad sweeter. Return the bacon to the skillet and bring the mixture to a simmer. Simmer, uncovered, until the liquid has thickened and most of it has been absorbed, about 2 to 4 minutes. Transfer to a small bowl and let cool slightly. The jam can be refrigerated for up to 2 days (bring to room temperature or gently reheat before using). In a large mixing bowl, combine the minced bacon, ground beef, Worcestershire, 1 t. salt and ½ t. pepper. Gently combine until well mixed but not overworked. 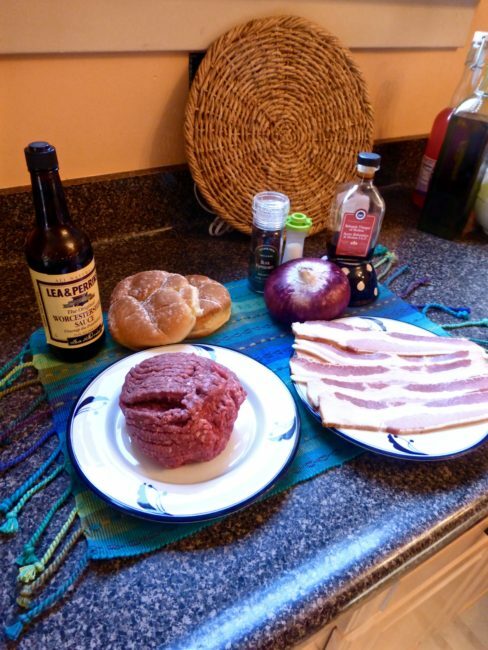 Form into four equal patties, each ¾ to 1 inch thick. Press your thumb into the center of each patty to create a deep depression. This will keep them from swelling up into mini basketballs on the grill. Prepare your grill for indirect cooking over medium-high heat (400 to 450F). 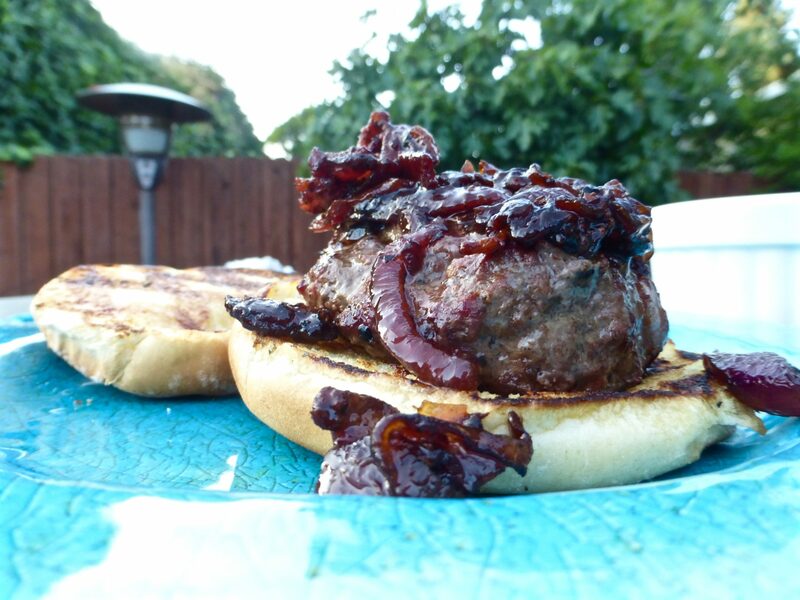 Grill the burgers over direct heat until grill marks form (4-5 minutes). Flip the burgers and grill for 4 to 5 minutes more for medium. Add an extra minute for well done. Transfer the burgers to a plate and tent them with foil. Toast the buns, cut side down on the grill until golden grill marks form, about 1 minute. We like to grill our buns with either butter or mayonnaise for a little extra crunchiness. 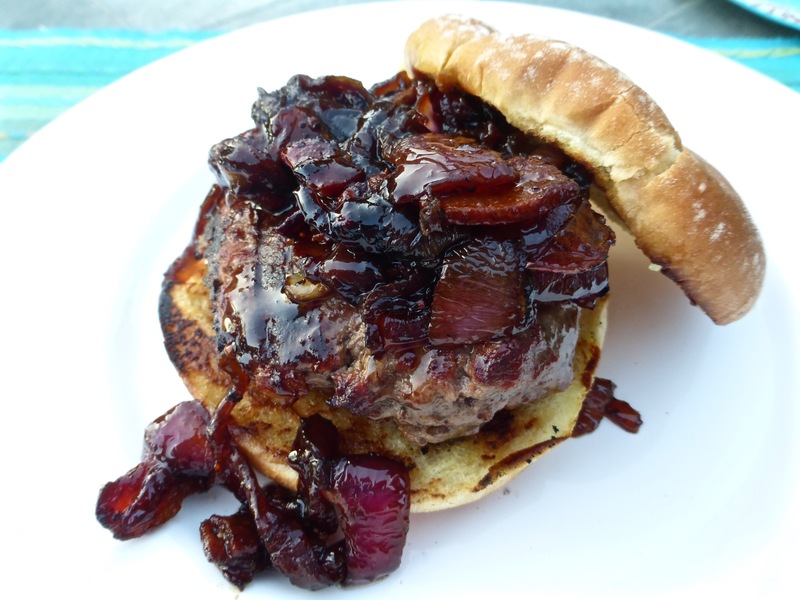 Serve the burgers on the buns topped with the Bacon-Onion-Balsamic Jam. Let summer begin!